APEC 2021 Confirmed to be in Auckland. Need Southern Airport Line NOW! It was confirmed yesterday that Auckland will indeed host the 2021 APEC conference. Auckland Mayor Phil Goff has welcomed confirmation that Auckland will host APEC 2021 Leaders’ Week, 8 – 14 November. “2021 will be an outstanding year for Auckland, hosting both APEC and the America’s Cup Challenge,” said Auckland Mayor Phil Goff. “These two major events will turn the eyes of the world on Auckland and New Zealand. “Each event presents a unique opportunity to showcase to the world our city and country as being smart, beautiful and well-functioning. “APEC is huge with 22,000 international attendees and 12 significant events. “Leaders’ Week will see the leaders of 21 countries and economies converge on Auckland including the rare presence in New Zealand of the Presidents of the US, Russia, and China, and the Prime Minister of Japan. “We last hosted APEC in 1999 but this time it will be much bigger. We will be looking to work with central government to bring forward to the extent possible any infrastructure projects that will help Auckland deal effectively with APEC and the America’s Cup,” Phil Goff said. Before the Planning Committee started yesterday I was having a discussion with Orakei Ward Councillor Desley Simpson over what project should be next given the Government will be funding their contribution to the City Rail Link in their upcoming Budget. I stated that the Manukau to Airport via Puhinui Busway should be next off the rank given congestion issues to, from and within the Airport complex (this includes the industrial complex along State Highway 20A). 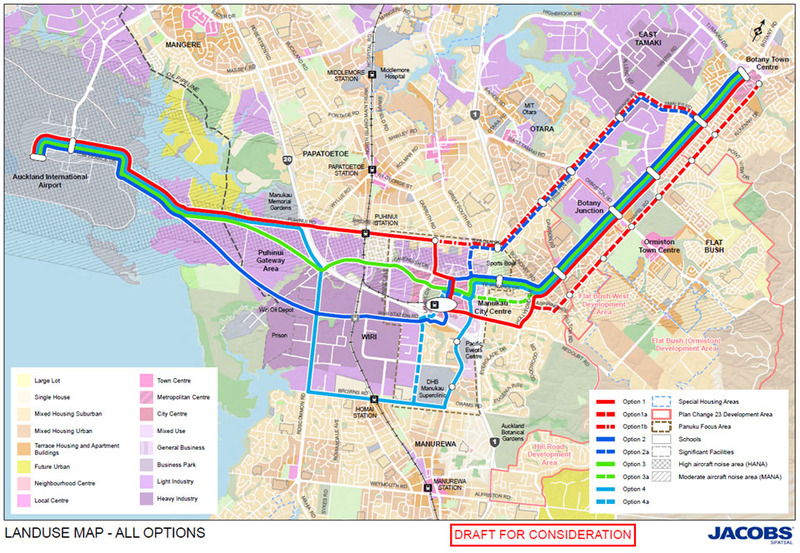 My reasoning was that this Busway is easy and cheap to build (in comparison to other projects) and utilises existing transit lines very well such as the Southern and Eastern Lines (that also connect to the Western Line and the Northern Busway). This is remembering we are not just focusing on passengers at terminals but more so the workers. In mentioning this I was asked to look at a more comprehensive package. So introducing the Southern Airport Line. 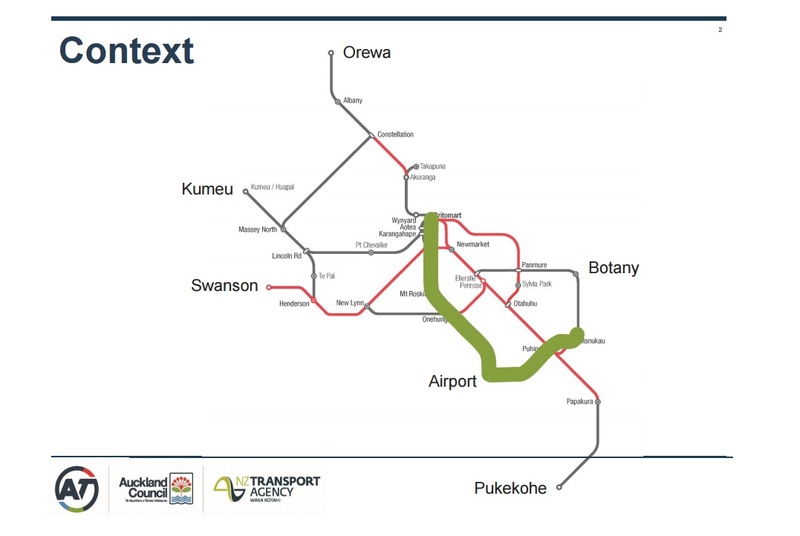 The Southern Airport Line takes its name from its two predecessors: the Botany Line and the current Bus Improvements (Airport – Manukau – Botany) so stated in the Auckland Transport Alignment Project (ATAP). The Southern Airport Line would start as the bus connection from Manukau to the Airport via Puhinui Station (and be possibly funded from the proposed ATEED Levy (the wrongly called Bed Tax)) before being fully upgraded to Light Rail (forming part of a Light Rail network to the airport from both the City Centre via Dominion Road and of course Botany and Manukau in the South.) Now I will get to the ATEED Levy to help pay for stage one of the Southern Airport Line in a moment. So again what we looking at here as the next project off the rank now that the City Rail Link is a go is the Southern Airport Line. The Southern Airport Line starts as a bus connection from Manukau to the Airport via Puhinui Station. Then in time the bus connection is then upgraded to a fully fledged light rail line no doubt in time to connect up with the Airport LRT Line to the City Centre via Dominion Road and a LRT line from Manukau Panmure via Botany. 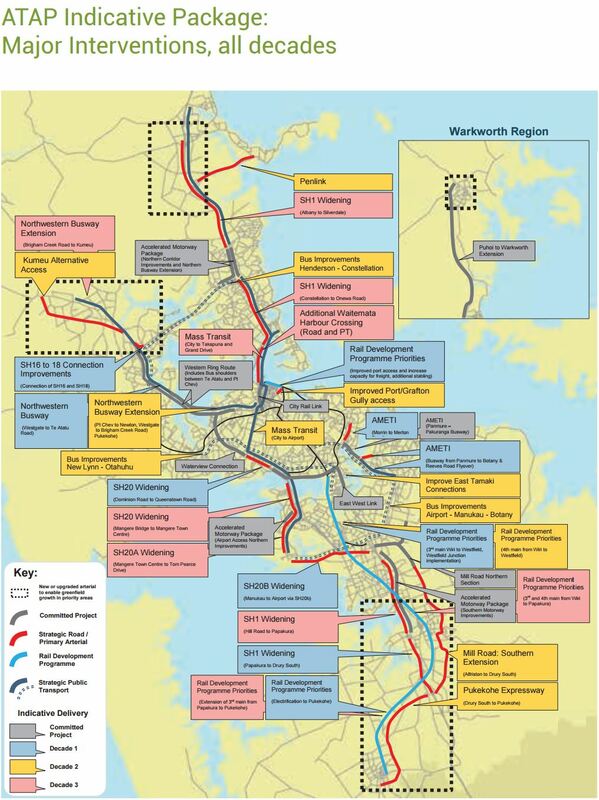 This in turn would give the South-East, the South-West, and the lower Isthmus a fully integrated Light Rail Transit system that connects to the heavy rail system and major bus hubs like Manukau Bus/Rail Station. Getting the Southern Airport Line off the ground would be a good quick win as the City continues to prepare for the Light Rail Line from the North (at least 10 years). With help of Central Government there is no reason to get the Southern Airport Line running by 2020. ATEED Tax to fund it? 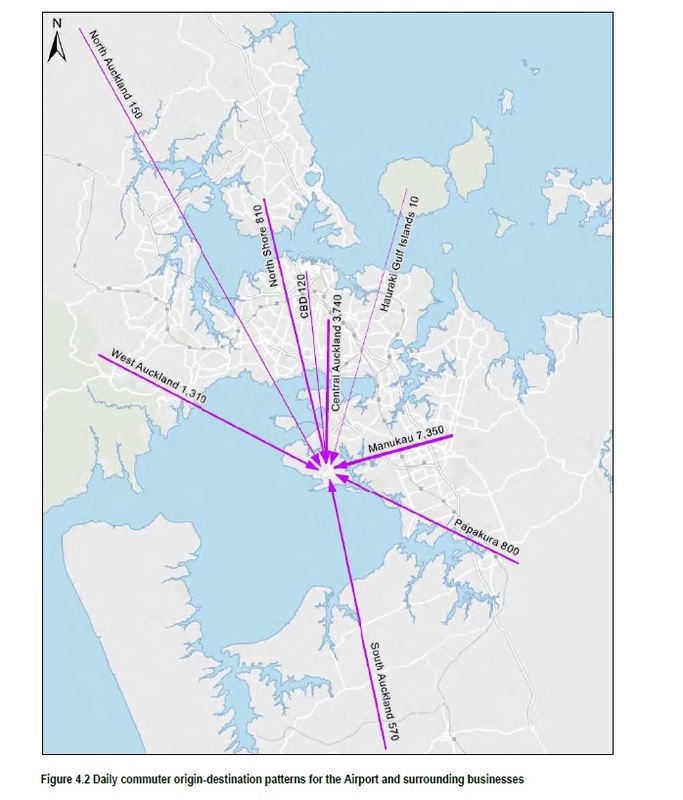 From the Airport to Botany via Puhinui and Manukau is $319m according to the ATAP document. Now I am going to assume given little development west of Manukau it would be $30 million for Puhinui Interchange (Manukau Bus Station is around ~$27m) and $100m for the busway from Puhinui to the Airport (Puhinui to Manukau would be 24/7 bus lanes). So $130m total. The ATEED Levy is meant to raise $28m/year and is designed to fund tourist and economic infrastructure in benefit of the City. Given the Southern Airport Line is a Capital Expenditure Project (CAPEX) it is funded by debt and repaid through the life of the asset. $28/m year on a very quick tourist and economic win that The Southern Airport Line is would repay that CAPEX in just 5 years. 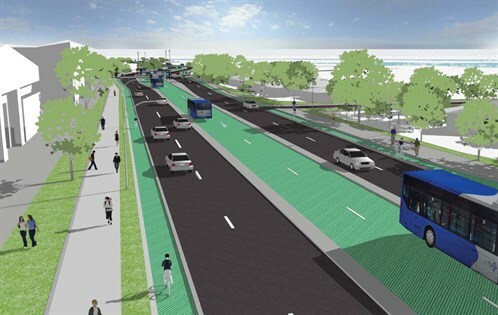 Given the busway is alongside SH20B NZTA could or rather should chip in as well lessening the cost on the ATEED levy. Councillor Simpson believes The Southern Airport Line would be a good project for the ATEED levy as a possible example. I would call this a very smart investment of the levy to pay for a crucial piece of infrastructure post City Rail Link. Why I chose the Southern Airport Line over the via Dominion Road option came down to simple what works now and beyond the defence in 2021. By 2021 LRT from the City Centre would only get down Dominion Road but not to the Airport so you end up missing a critical link in moving people from the Airport to the City Centre. The LRT via Dominion Road route who as I have mentioned before does not solve (as it were) the commuter issue to and from the airport which comes from the South. In comparison you can get LRT from the Airport to Manukau City Centre (Manukau Bus and Rail Station) using Auckland Transport’s Option One complete by 2021 with the Airport to Puhinui Station stage done within two years (so 2019). The beauty of the Southern Airport Line is it links up with two major interchanges: first the Southern and Eastern Lines at Puhinui Station allowing a two seat journey from the Airport to Britomart, the second being Manukau Bus Station that serves as the primary bus hub for Southern Auckland allowing feeder busses into both the Eastern Line and the Airport Line. Remember I am catering for both tourists AND commuters. You will probably ask is LRT overkill on the Southern Airport Line and why not use Double Decker Busses seen else where? The route is not suited the double deckers nor is the type of patronage that the route would serve especially those with luggage. And while a double decker holds 144 passengers and a LRT unit around 400 I would go with the 400 right off the bat with a train every 15 minutes minimum. Again remember I am catering for commuters as well as tourists and inter city traffic. Also the Puhinui Gateway industrial complex along SH20B has live Light Industry zoning per the Unitary Plan. That complex while fields for now will be the second major airport logistics warehousing complex similar to the existing one along SH20A. Logistics bases are land intensive and generate a lot of traffic both goods and people. NZTA are already preparing the case to widen SH20B to cater for this future growth. We might as well get light rail in alongside SH20B at the same time and chuck in a station to service the new complex. Remember and again I am looking at transit that services commuters, tourists and inter-city traffic. If that new industrial complex gets going rather soon we will be wishing for that transit line to avoid the mess that is currently SH20A! As Greater Auckland says build it and they will certainly come especially as the inter city benefits begin to pay off. 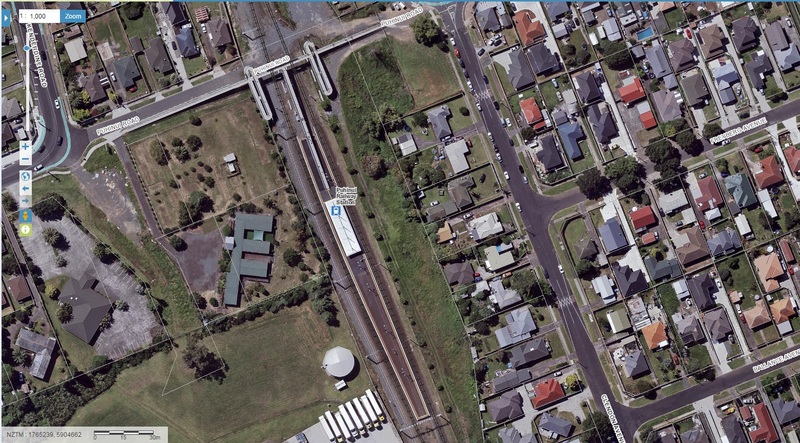 Those who travel the Southern and Manukau Lines in Auckland wouldn’t think much of Puhinui Station. Puhinui current sits in between the larger Papatoetoe, Homai and Manukau Stations all which serve as interchanges in some form. While Puhinui Station serves as a transfer point between the Southern and Manukau Lines its role could be a whole lot bigger within the next decade. Puhinui sits prime on major transport routes to both Manukau City Centre and the Airport complex. There is also sufficient enough land belonging to Kiwi Rail to build a proper interchange at Puhinui Station with four platforms and an extra track free for freight trains to bypass the station. This is made possible with four mains and a loop running through the interchange site. 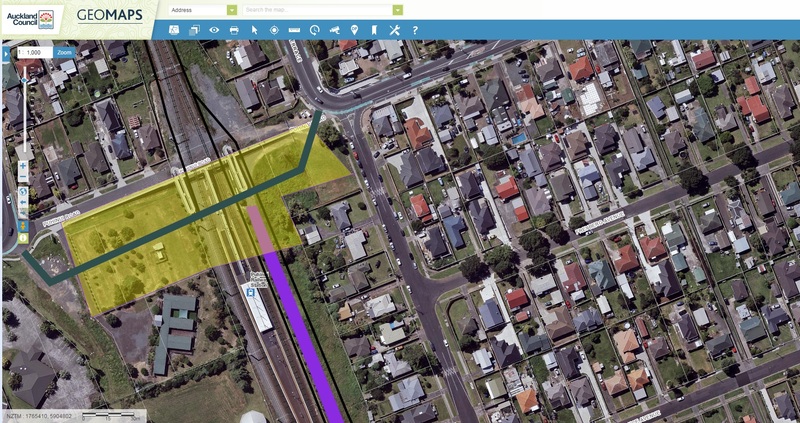 Technically the Fourth Main (the Third Main on the left hand side would be kept clear for freight) would service Platform Three with an extra loop servicing Platform Four as demand allows but none the less we will need four Mains between Wiri and Otahuhu to get best use out of Puhinui Interchange. As I noted earlier I have kept the Third Main on the airport side clear of any platforms to allow freight trains to run through the Interchange area unimpeded. The existing two Mains plus the Fourth Main take up Platforms 1-3 to service commuter, airport and inter-city patronage with an extra loop on the Manukau side forming Platform Four if demand ever warranted another platform (such as an inter city train heading south and keeping the other Mains clear given the extra loading time that might be needed). The yellow is the interchange area while the grey is the bus line to and from the Airport remembering the interchange will need to be able to service Light Rail when the time comes to turn the Southern Airport Line from a bus-way to Light Rail Transit line. How Puhinui Interchange will look in a wider context. The white lines are the two existing Mains with the black the Third and Fourth Mains in utilisation. You can see where the new platform along with a loop track goes keeping the Third Main entirely clear for freight trains. The Third Main also allows for the electric passenger trains to enter and leave the Wiri depot without impeding on the other three Mains. This is how Puhinui Interchange would interact with Manukau Station and the Southern Airport Line from Manukau to the Airport. You will also notice that I have added the Manukau South Link back in there allowing services from Pukekohe and Papakura to Manukau directly without a transfer at Puhinui Station. With Puhinui Station set to be a major interchange handling commuter, inter-city and airport traffic, re-directing Manukau passengers away from Puhinui Station through a direct connection to Manukau from the South would ease loading pressures at Puhinui. So the economics of the Manukau South Link do make a comeback with the Puhinui Interchange and the Southern Airport Line. The Southern Airport Line would be ready by 2020!